Before 1814 Pembroke Dock was known as Paterchurch and was little more than a small fishing village. The Royal Navy at Milford Haven decided to move their shipbuilding further inland from the mouth of the estuary and Paterchurch was selected as the most ideal location. This decision transformed Paterchurch into a town and the thriving dockyard produced a great number of ships before its closure in 1926. In 1938 the dockyard, now under the Air Ministry, received its first Sunderland flying boat and the flying boats operated from Pembroke Dock until as late as 1957. During the second world war it was the world's largest flying boat base. Pembroke Dock today is a ferry port and with good mooring and watersport facilities for tourists. It was acquired in 1988 by the Milford Haven Port Authority. The port offers the facility of a major deepwater, dry cargo dock. At present, the port handles some general cargo and aggregate, together with certain oil rig supply support vessels. 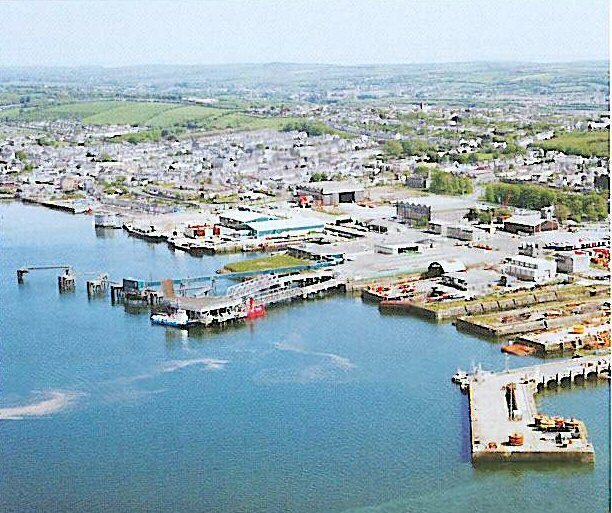 The £38 million purpose-built Ro-Ro Terminal at Pembroke Dock provides comprehensive modern, ferry terminal facilities. It is used twice daily by Irish Ferries for their ferry service between Pembroke and Rosslare, and there are occasional calls by other ships. The Milford Docks Company provides all on-shore services at the Ferry Port.